Published by the illustrious UK stationary and art book house, I had a number of books by this man and others who were made famous by this society. (I.E. Ella Bruce, Jean Gilder, Truda Mordue, Audrey Tarrant, but most namely Molly Brett -- I'll be posting on her in the days to come). This guy talks a little about the author and the society, but his blog post was the most I could find without going too deep. Needless to say, these books littered my bedroom floor when I was wee. This one in particular happens to be my son's favorite of the Mexican moment. It is yet another tale of a naive domestic animal that believes his cushy, caged life is far superior to a wild one. I imagine under the influence of Beatrix Potter -- who was and is a national monument in the UK -- there were a lot of British illustrators who grew up wanting to draw and write stories in a similar style. The Medici Society authors all did it... i.e. spin sweet stories of quaint talking animals roaming the English countryside. Podge is a guinea pig with an adorable cowlick. Told from his point of view, the story opens with him getting plucked from the pet store and out to a new home with his two elementary-school masters. The likable Podge quickly becomes friends with some of the local wildlife. A romp with an impish rabbit almost gets him disemboweled by a hawk -- making him thoroughly appreciate his luxe wire mesh walls and bed of fresh hay. 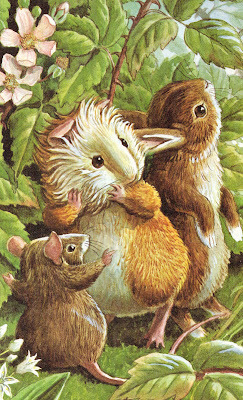 Too cute is this scene where the rabbit (aka Floppitty) introduces Podge to his hare family. "We've never seen anyone quite like him before. What exactly IS he?" All of the rabbits stared at me very hard. I began to wish very much that I had long ears and some sort of tail. "It's a sort of a pig thing and costs about a guinea," explained Floppitty. "He's very rare you know, so I brought him to show you -- and show you to him." "I haven't heard him grunt," said one young rabbit. "Farmer Mangold's pig grunts no end--and his ears flop over his eyes." "That just shows how rare this one is," said Floppitty. These books are must-haves for those wanting to raise a houseful of Poppins' tots, as I'm sure every Generation X kid in the United Kingdom fell asleep to these stories. Definitely worth rediscovering.